Over 30 of the Crew headed to warmer climates last weekend for the Gold Coast Marathon Festival. Whilst the heat may have been slightly kinder than some years, the high humidity made for challenging race conditions. Sinead Diver continued her sensational 2018 form in the Half Marathon, securing second place in an incredible 1:09:53 making her the second fastest Australian at this distance behind Lisa Weightman! A truly outstanding performance from a great athlete that inspires many of us to continue to strive for our best. 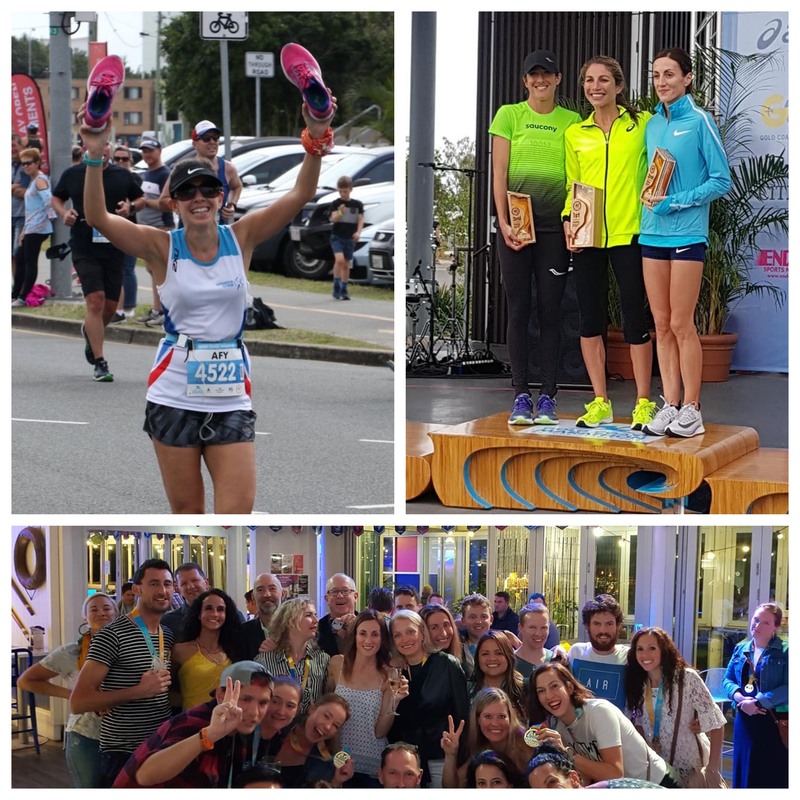 Successfully completing their first full marathons, congratulations were in order for Helen Stevenson, Kat East and Kristianna Nagorcka. Great to see so many of the Crew staying back after their own runs to cheer them on and across the line. PBs came hard in the heat and humidity, but there were still some outstanding performances to recognise. Ben Briggs, Sean Helmot and Lincoln Mah all delivered sub 3 hour marathons with personal best times. Jono Jack continued his improvements in form just missing out on his sub 3:30 goal by 90 seconds. Noteworthy female performances included Serina Dowding shaving 8 minutes off her marathon PB, whilst Julie Smith gave a text book lesson in perfect race pacing producing a solid 3:24:42 with negative split! How could we not mention Afy Afrouz who’s solution to sore feet and blisters was to run the last 10km in bare feet, still managing to finish in under 4 hours! In the Half Marathon, Carolyn O’Sullivan and Emma Wills also achieved solid new personal best times. Ensuring the Crew were represented well across all distances, Andrew Kincaid achieved second place in his Age Group for the 10km with a highly respectable 43:16. No Crosbie Crew marathon would be complete without the Rehydration and Kudos to Dean Fergie for co-ordinating a great social evening at the Helm Bar. The Crew were in high spirits as they celebrated their achievements and let their hair down after the hard training season. As the heads clear and the bodies heal, we look forward to doing it all again in October at Melbourne!